Picture ID (i.e. Driver license, Military ID, School ID & etc.). Co-payment (Visa, MasterCard, American Express, Discover, checks or cash). Detailed list of medications with dosage that you are currently on and the actual medication bottles. Children visits: Please bring immunizations records. Hospital follow-up visit: Please bring any records from the hospital and sign a medical release prior to your appointment. Bring all filled out paperwork from our website (see below). Appointments may only be scheduled by calling our office at 727-834-8377. How long does it take to get in to see the doctor for a sick visit versus a physical? 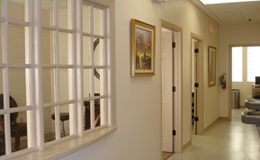 Once you have been established as a patient with us, we strive to see sick adult patients within a 24 hour period. Sick children will be seen same day, unless you call late in the day and then we will see them the next morning. Well adult and well child physicals can be scheduled on a first available basis. What is your policy for canceling appointments, and can I do it online? Our office policy is that appointments that are cancelled on the same day as the appointment MAY be subject to our $35.00 cancellation fee. Patients that fail to show up for their scheduled appointment without prior notice WILL be charged $35.00. Please call our office to cancel any appointments, so that we are able to help you reschedule at that time. Once I have become established as a patient with your practice can I see either doctor? No. Our doctors do not see each other’s patients. If you choose Dr. Shirmo as your physician, you will NOT be able to see Dr. Eldridge and vice versa. This policy ensures continuity of your medical care. However, the Nurse Practitioner may see either physician's patients. Can I email questions to my doctor and will they respond to me via email? Due to the fact that no email is ever truly secure, it is not advisable and therefore the doctors do not communicate via email. I get frequent sinus infections or urinary tract infections and know which medicines work for me. If I call in, do I have to make an appointment every time to see the doctor or will they call something in for me? Drs. Shirmo and Eldridge DO NOT practice phone medicine. Although we understand it is not always convenient to come in, we feel it is not wise to treat any patients’ symptoms over the phone in the event something may be missed in translations or unseen. We encourage patients to address any necessary refill requests at their appointment. If you need a refill at any other time you may call our office to request a refill. It is the patient's responsibility to know when they have a 2 week supply of medication left and to call our office at that time for a refill. We ask that you give our office 5 days for refill requests to be processed. Refills will be handled during normal business hours only. There is no such thing as emergency refills. Which hospitals do your doctors admit patients to? Drs. Shirmo and Eldridge have admitting privileges at The Medical Center of Trinity, North Bay and Mease Countryside Hospitals. Our doctors, however, do not make rounds in any of the hospitals. We have designated groups of hospital doctors who will notify and update us throughout your patient stay. This allows our doctors to help coordinate the care you receive while in the hospital with the care you will need after you are discharged. Due to insurances changing so often, please call to verify whether your plan is accepted or not. Do you accept Medicaid as a secondary to Medicare? We are not contracted with any of the Medicaid plans and are unable to get authorization from Medicaid to refer patients for any tests or to any specialist. Do you take Workers Comp? No, your employer has a contract with Workers Comp doctors. Contact your HR department. Do you file Auto insurance claims? Yes, you will need to provide your Auto insurance card / policy number, accident claim number / accident report, claims mailing address, adjusters name and phone number. Please also provide your attorney's contact information, if applicable. What if I need an authorization? It is the patient's responsibility to know whether their insurance requires authorization for specialist visits or procedures. If you need an authorization we will be happy to initiate the process once you inform us of your specialist and/or procedure appointment date and time. We require at least 72 hours notice for authorizations to be processed. Note: These files are in PDF format and require Adobe Reader to be viewed. If you do not have Adobe® Reader® on your computer, you can download it for free by clicking here or click on the Get Adobe Reader icon.